​Are you feeling stuck in your business? And even more frustrating ... you don't even know why?! ​I hear you, see you, and feel your frustration my fellow solopreneurs. I've been there too. I've spun my wheels, planned myself into paralysis, listened to too many 'experts', and wondered "which of these zillion possible things am I supposed to be doing TODAY?!?" A solo pal I've been working with recently asked me, "Jennifer, to put the rubber to the road, to get this done and out there, what do I do next?" She wasn't looking for grand marketing advice, she wanted an action plan and a to-do list of marketing ideas. She was ready to do the work, she just wanted some help knowing where to start and where to focus right now. ​Does that sound like you too? Would you like to get on track - quickly - no long-term commitments? I'd love to get together with you for a concentrated, hands-on, roll-up-the-sleeves together, 60-minutes of serious marketing mojo. We identify a single marketing problem to focus on together. We brainstorm and work it out. You WILL leave with a PLAN! You'll have a set of actions, a to-do list you feel confident you can rock out right away. ​What can we do in a power hour together? ​Review your About page to see if it's telling a compelling, client-attracting story, and not reading like a resume. Get pointers and resources to write a better bio. ​Do a marketing tech & tools review - what are you using now, do the tools fit your business and budget, what are the minimum tools you need online these days, what other tech fits you NOW - not 18 months from now. Walk away with your ideal tech list. ​Walk through your website: review headlines and calls to action, look for opportunities to tweak your site so it better reflects you, look at your theme, check your security, and even get a list of recommended plugins or tools for boosting your site. ​Let's talk smarter social media scheduling and which of the many too​ls out there fits your style, budget, and business needs. ​Devise a 30-day plan for ​for action and engagement. ​Or we can talk about webinars, or easy action plans for following up after events or with past clients, or any number of get-clear, easy-to-implement, right-for-YOU marketing actions to take right now and get you UNSTUCK! ​What I've found that helps is narrowing our focus - set aside one good chunk of time, get clear on one goal at a time, create a reasonable action plan and to-do list - and for a minute let's forget about any yearly resolutions or big goals. We gotta get clear on what we are doing THIS month, and THIS week, to no longer feel stuck and to happily, clearly move forward. We can DO this! I invite you to borrow my brain on an as-needed basis to solve your immediate marketing problems and feel unstuck. Borrow My Brain sessions cost $147 each, are 60 minutes via Zoom web calls, and you get the recording, any notes, ​plus additional resources I send you. After you purchase a Borrow My Brain session you'll get a link to my calendar to schedule our session together. We email to confirm the problem area to laser-focus on, and then BOOM, we combine brain power ​to get you unstuck and zipping forward again. ​YOUR CHANCE TO GET UNSTUCK ​TODAY! 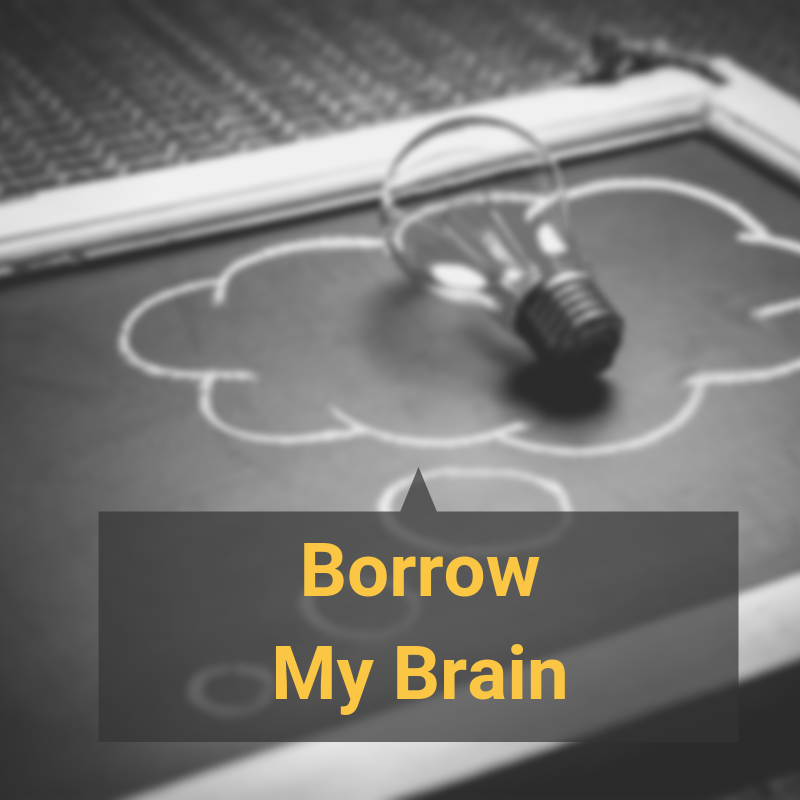 ​​Borrow My Brain sessions are a pretty good deal at $147​, especially with the extras you'll get, and the feeling of being unstuck and raring to go. Let's get together for just 60 minutes ​and you'll be feeling your mighty marketing mojo! Grab a session for ONLY $47!